A Penguin save the date bookmark to ask wedding guests to keep the wedding date free. A Penguin save the date bookmark to send to guests to let them know that a wedding date has been set. 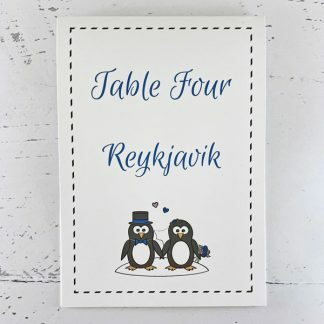 The design co-ordinates with the Penguin range of wedding stationery, which includes wedding invitations with RSVPs and matching stationery to use on your wedding day. The design on these save the date announcements features two penguins dressed as a bride or groom – if you’d like penguins that aren’t in their wedding outfits, or two brides, two grooms, etc, that’s no problem. 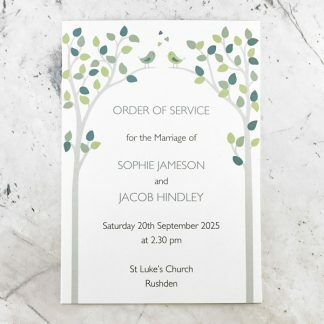 The text can be fully customised but would usually include the date of the wedding as well as the location if known. The penguin design is based on two colours – used on the penguins and for the text. Colours for your Penguin design wedding save the dates can be chosen from the wedding stationery colour chart. Each Penguin save the date bookmark measures 7 x 18.5 cm. 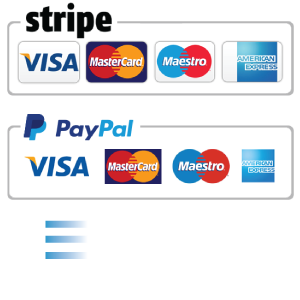 The design is printed on 300 gsm white or ivory card with a hammer (textured) or smooth surface. 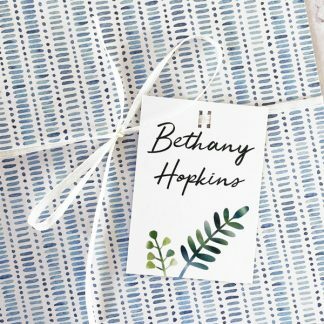 A co-ordinating white or ivory envelopes is supplied with the bookmark.